If you’re reading this post, chances are you know that all apprentices in future will go through end-point assessment, independently carried out by an Apprentice Assessment Organisation (AAO). Sector organisations of all shapes and sizes are considering whether to become an AAO, but many have unanswered questions and are unaware of what’s involved. At the beginning of July there were 112 new standards and assessment plans ready for delivery, with 400 in the pipeline. Take a guess at how many approved Apprentice Assessment Organisations there were who could deliver end-point assessment? Sixteen – yes, you read that right – sixteen. 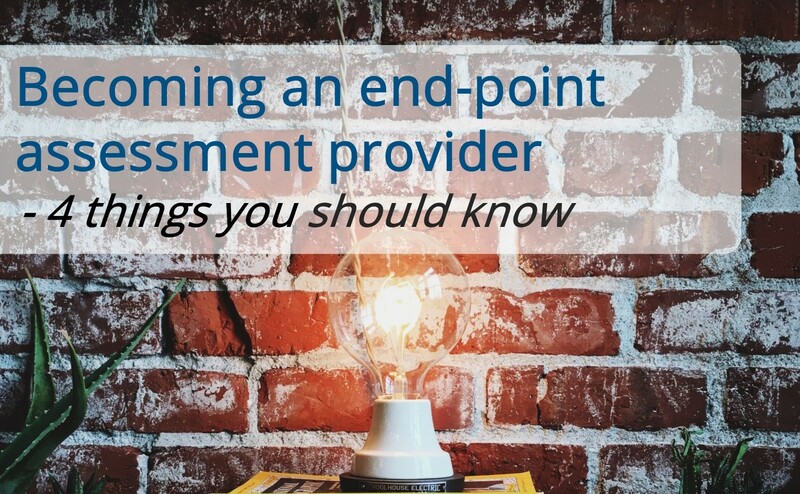 Many aren’t ready to deliver end-point assessment either. If you currently deliver apprenticeships, you probably deliver (and are funded for) both the training and assessment. In the new world, the end-point assessment will be handed over to another organisation, along with a slice of your income. Becoming an AAO (or getting involved through a different route) will not only help to inform your ‘on-programme’ training, but will give you an opportunity to deliver a higher number of end-point assessments, than the number of apprentices you train – thus, increasing your business. There are significant opportunities to be explored. Caught your interest yet? “Yes”, you say “but we’re not really in a position to formally set ourselves up as an AAO through the Register”. You’re right – for some organisations, becoming an AAO in your own right may not be the best route. There are many other option – what other organisations could you collaborate with, perhaps regionally or in a particular industry? What are your expertise? Awarding Organisations, who have been quick off the mark, are already looking to gather a pool of assessors to deliver end-point assessment. Perhaps contracting out your assessors is the best approach? Lot’s to consider. But before you decide – you need to know what the options are. The Register of Apprentice Assessment Organisations isn’t that complicated, and yet half of all first applications fail. Why is that? Many submit applications without really understanding the role of end-point assessment and how it differs from the ‘on-programme’ training. Before you apply, you really need to know what assessment plans you want to initially deliver, what’s involved and how it will work. You will need to convince the SFA that you have the relevant industry knowledge, expertise and resources in place to credibly deliver end-point assessment. Afraid not. Assessment plans will be very different to what you are used to. There are a huge variety of assessment methods specified in assessment plans. Each will need careful thought and design. Take a simple multiple choice test. You may be required to develop a bank of 400 questions – 300 for assessments, and 100 for mock assessments. Each of these questions needs to be robust – you will need to have an appropriate range of options to each question that isn’t too obvious, or too obscure; you will need to avoid predictable placement of the correct answer; or making the question too wordy or convoluted. And that’s just one method of assessment. Some assessment plans will also require you to have specialist (and sometimes expensive) equipment or facilities to carry out the assessment. Can your employer contacts support this? Is it financially viable? Lot’s to consider – and this is only surface level. But it’s an open market with significant opportunities.